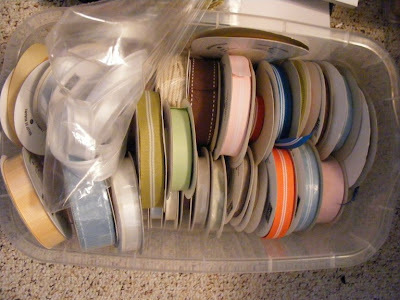 It's no surprise to anyone who reads this blog that I am a MAJOR ribbon addict. TRULY, certifiably addicted to ribbon. I had gotten to a point where I had ribbon all over my stamp room, in a zillion drawers... with no rhyme or reason. I had even resorted to sticking ribbon in empty tote things and putting those totes on TOP of my drawers, because I could no longer fit anything IN the drawers! UGH! If I needed some ribbon for a card, I generally knew the vicinity to look in, but there was no guarantee I could find it in a reasonable time without getting tangled in it. "ENOUGH IS ENOUGH", I said to myself about three weeks ago! LOL Just to be clear, I didn't mean "enough is enough ribbon buying", I meant "enough is enough with the lack of organization". I just wanted to throw that out there so you all don't think I grew a ribbon backbone! I STILL love ribbon and if I REALLY love it, I AM going to buy it! LOL OK, disclaimer over, now let's start the ribbon wrangling. I sat and thought about what would make my life easiest. What would make the most sense? COLOR! I decided I wanted all my ribbon organized by COLOR! Then, I started hyperventilating KNOWING how ridiculous of a task it was going to be. LOL I realized that I had a TON of different brands and spool sizes and that concerned me. I didn't want it to be all funky and hard to dig through, so I did the unthinkable... I stripped my ribbon off the spools! YES, I am serious. VERY FEW of my ribbon spools made it out alive! LOL The ONLY way I left it on a spool was if there was a TON of it on a spool (30 yards or more) OR if it was my SU ribbon (haven't "wrangled" that yet). I started by going to Walmart and buying tons of baggies from the craft section. I bought LOTS of 2 X 3 (you'd be surprised by how much ribbon fits in there, 3 X 4 and 4 X 6. I think I spent about $30 or so in baggies. I wanted each ribbon to be separated in it's own baggie so I could keep it under control. After the loose ribbon was done, I started tackling the spooled ribbon. MOST of the spools I had were 5 yards or less. I just ripped off one side of the spool, then took the ribbon off the spool, then wound it around my fingers so I had little wound pieces. I also sorted through as I was doing this and bagged up a TON of spools to sell. Again, I don't care HOW much you love ribbon, one person does NOT need 15 spools of black gingham! LMBO! If it was a 10 or 15 yard spool, I attempted to slide it off the spool so I didn't have to re-wind it. This worked most of the time. Another option, is leaving the center of the spool on (if it's small in diameter) and just removing the sides, which add a lot of bulk. The spooled ribbons took me about 15 hours to sort through and wind. When I was done winding and bagging, I then sorted it all into piles based on color (I actually sorted along the way using the drawers I was emptying). Once I figured out how MUCH of one color I had, I was able to determine the size of drawer I needed for each color. I was able to fit the ribbon into probably less than half the space I was using before. If I happen to have some multicolored ribbon, I place it in the drawer that matches the dominant color. If there is not really a dominant color, I placed it in a "multicolored drawer". My plan is to use that drawer if I want to "start with the ribbon" and build a card around it. I'll be back in a bit with a card! Now that my ribbon is wrangled I have actually had time for STAMPING and have THREE cards done and another one started! Wow. What a huge project. It looks like you did a great job. I have ribbon envy! AWESOME! What a fantastic idea! My ribbon storage - or lack there of - is driving me crazy. The concept of getting the ribbon off the spools will help me out A LOT! TFS! Congratulations on finishing such a big job! I LOVE this organizing method! I've mulled over the card idea and wasn't sold on it. I know I need to get rid of all those bulky spools. I think this is my winner!! Thanks you SO so much for sharing this idea. I really believe this is something that will work for me and that I will maintain. absolutely, fantastically, a wonderful idea!! !Thanks for the inspiration, and for having the stamina to complete what must have been an exhausting job! You've just helped a gazillion women out here in the crafting world!! Wow and I thought I had a probelm since I live near an OFFRAY outlet. Now that it's organized would you come here and organized me? WOW! What a ton of work, but the results are fantastic! Now you'll probably actually USE more of that wonderful ribbon! Oh man. I've been hemming and hawing, procrastinating the ribbon re-org I want to do, and I'm sure I don't have a quarter of the ribbon you have! Way to go, girlfriend! I've bought the Ribbon Ring supplies, but can't make myself sit down to do it yet. Wanna talk me into it? And how about a private sale for your BSFs of some of the ribbon you have just too much of?! I'm sure we could help you make more room for new ribbon!!! Wow! You've done an awesome job!! Bravo!! Congratulations on your project completion!! Great job! I heart all your ribbon and slowly and I do mean slowly I am starting my stock pile. Hugs from Conroe TX! Great job. That sure is a LOT of ribbon! I have a couple suggestions for you. Punch your favourite shape out of cs and stick that to the front of your drawers instead of a boring label! Use striped paper for the striped/no dominant colour ribbon and kraft for the naturals. You mentioned that some ribbons are still on their spools, you can trim the 'wheels' down over time to make them smaller. My last tip is about baggies. Please do not buy them at Walmart!!!!!!! Most towns/cities have packaging supply stores. Try stores that sell moving supplies too. These are often in the industrial areas of town so you might not drive by often. Check online and under packaging in the yellow pages. The sell baggies by the hundreds and they are only a few dollars per 100. Those sizes are less than $3 Can, in fact I think they were about $1.50! I got out of there with 3 sizes including some larger plus tax for about $8-10! The ones I get are even food storage safe so I use them in my kitchen! (Although we try to use greener alternatives as much as possible!) They have every size from 1x1" to over 12x15"! Oh, I do love me some ribbon too, but I gotta admit, you've got me beat with your supply! I am reading backwards and am now seeing the pics, so disregard asking in today's post about seeing the pics! I love what you've done, and would love to be a fly on the wall when you work.......love your creativity! I seriously am without words. I'm going to move myself in and start playing with all that ribbon. I'm having a serious case of Ribbon Envy! lol And I thought I had a lot of ribbon!!! hahah Great work. Oh. My. Goodness. I am in total awe of your wonderful organization (AND at the amount of ribbon you own!) It will feel SO good to be done & think of how easy it will be to find just the right color! Holy Moly!...that is AWESOME! I love all the prettycolors all stacked up! But even more, I love that you had that much ribbon and it took you weeks to organize...I'm working "again" on my stamp room today, with the goal being to actually be able to make it to my desk. I'm going to firward your post to my hubby so he knows I'm not the only one!! :) Thanks for the encouragement....it CAN be done! woo hoo! Give me a call when it would be a good time for me to come over and roll around in your ribbon! Send all your excess black gingham to me! I am all out. Oh and while you are at it . . . JK! This is so amazing. I am so jealous....so much ribbon and I`m not there. Wonderful. If you ever feel a need to get rid of some of that ribbon I will gladly give them a new home. Holy bananas girlfriend! YOU ARE DA' WOMAN!I hope you are very proud of yourself and feeling very accomplished because that is quite a task you tackled! I am very ribbon envious - do you LOVE just pawing through the color organized bins now? I would! Great job and thanks for sharing! Wow, TFS your idea, I am getting a new studio built for me, and have been browsing for ideas how to keep it organised, and voila... your ribbon idea is great! really cool!Rubber hugs always! I have never looked all the way through your blog.....but, I had a little extra time and so here I am! You are seriously addicted to ribbon....and I can tell it makes you really happy!! Love your new stamp room....I am seriously jealous! Love your creativity and blog! Wow, I think I've found my "Ribbon Soul Mate" lol! I super duper LOVE ribbon! But I don't have nearly as much as you do. I did however organize mine very similarly though! O.K., so I read this post awhile ago... and have been using this ribbon capturing method while I reorganize my craft room. It is working well for me because, (1)sounds wierd, but I LOVE baggies for organization and storage!, (2)I like things to be kept out of sight and free of dust, and (3)I also am a color coding fiend. Fabulous idea, works great for me! THANKS!!!!! !